Every August, the College Football Pre-Season Poll comes out, and I never know what to make of it. Should I be glad that my beloved Buckeyes are in the top 5? I decided to look to the past to see the correlation between the Pre-Season Poll and the Final Poll. If you’re a Pre-Season Top 5, you’re in good shape. 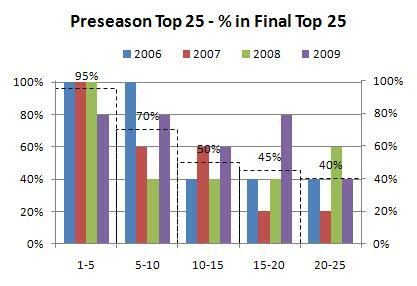 In the last 4 years, all but 1 Pre-Season top 5 finished in the top 25, and 45% finished in the Top 5. The Top 10 will likely be in the Top 25 by season’s end. But for 11-25, things aren’t so certain. 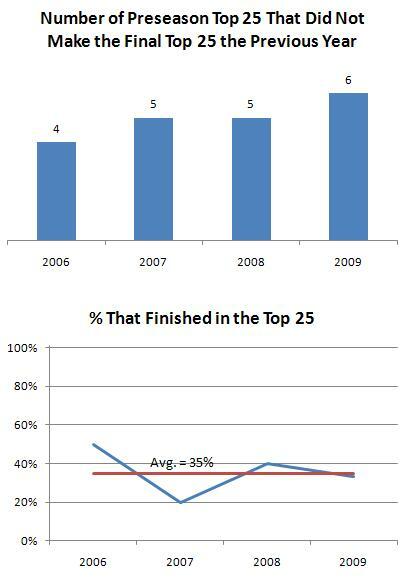 For 11-15, only 50% made the top 25 over the past few years, and the picture is even bleaker for the Bottom 10 – under 50% finished among the Top 25. 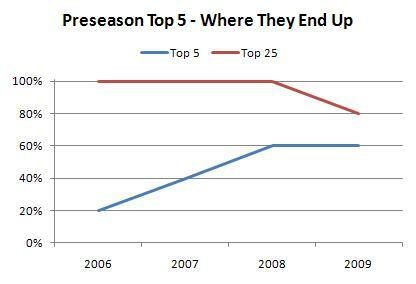 One could even say it’s a curse to be in the Pre-Season 16-25. If you think being ranked 16-25 is bad, it gets worse. This year there are 7 teams that didn’t crack the Final Top 25 last year (Oklahoma – 7, Arkansas – 17, North Carolina -18, Florida State – 20, Auburn – 22, Georgia – 23, Oregon State – 24). Voters feel that either they had an off year last year, or the program is up-and-coming. History disagrees. Only 35% of teams in this situation finished in the Top 25. That’s worse than being ranked 21-25. Don’t count on seeing most of these teams stick around.